I was delighted to be asked to contribute to an expert guest blog post by Talkwalker. 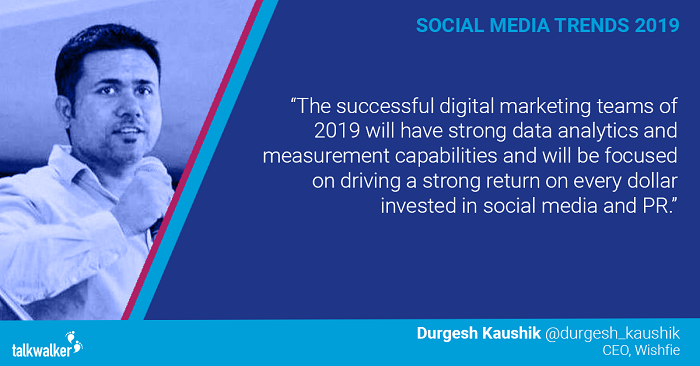 Check out my contribution to the top social media trends of 2019 below. It’s that time of year again! 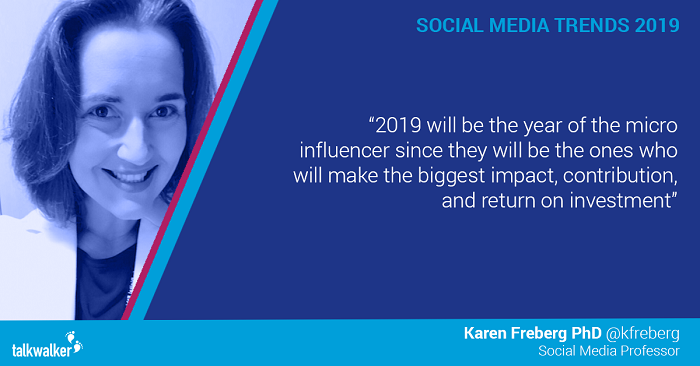 When we gather the biggest and best experts, to discover the social media trends that will matter most in 2019. If you want to stay ahead of the game, you want to read this! It doesn’t seem 12 months since we last revealed the trends that would shape 2018. But what about 2019? 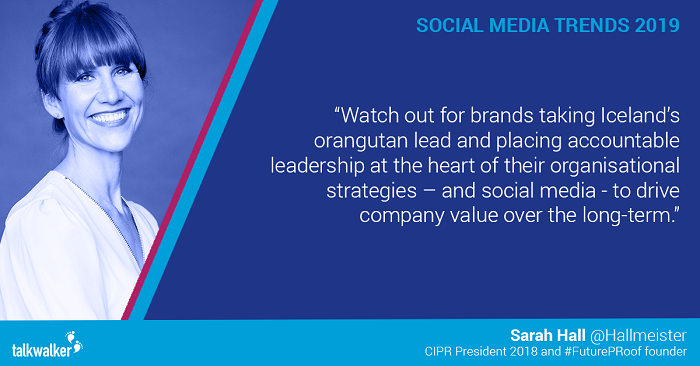 We have a fantastic collection of social media experts, marketing influencers, and PR consultants to give you insider insights into what will be impacting your strategy next year. We’ve even found the best social media campaigns of 2018, that foresaw the trends for some early impact. The next age of data – trends surrounding changes in data. The technology revelation – trends involving technological changes. The self-adoration society – societal changes that will impact marketing. We can’t cover the big trends without looking at data. With the rise of GDPR and a greater awareness of the protection of personal data, brands & analysts need to handle their data streams effectively. Not only that, but how businesses integrate data into their marketing strategy is changing. KPIs are merging, departments are realigning and businesses are getting more data savvy. 2019 is going to shake things up. Who would have thought that 4 letters could be such a problem? Expect 2019 to be the year when businesses become more aware of the importance of secure data, and the dangers of unreliable/dirty data. We’ll also see how brands will handle the minefield of data transparency, and measure the impact of GDPR. 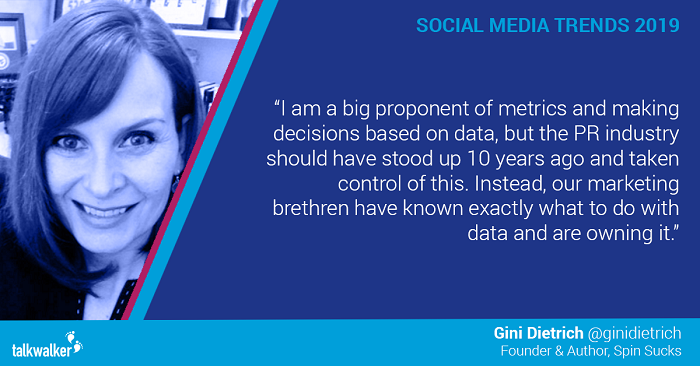 “Every data scientist and machine learning practitioner in the world, at every company and every level, needs to be taking a hard look at their governance and ethics procedures around bias. We’re seeing more cases every day of algorithms creating emergent, unintended consequences (see the most recent high-profile case where Amazon scrapped its AI-powered hiring algorithm due to systemic bias against women) where insufficient time, effort, and resources went into mitigating bias. Vanity metrics are dying. 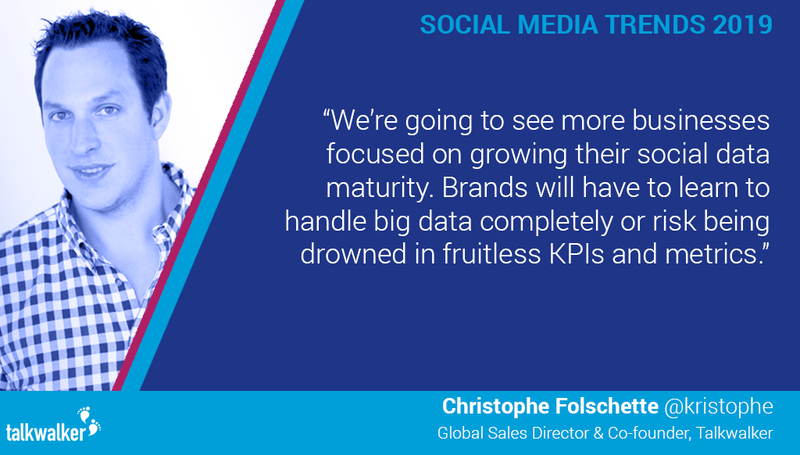 The next big social media trend will be to focus on ROI as the key to measuring the impact of social and PR actions… We’ll see in 2019 when campaign success will be driven by more tangible metrics that ultimately lead to sales. 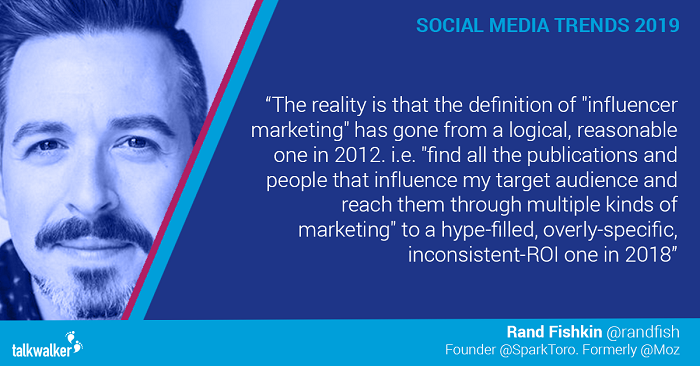 “As we move into 2019, more and more CMOs are coming to us and saying “Marketing isn’t working anymore”. It’s true to say that “what got you here, won’t get you there”. People don’t look at adverts, GDPR has killed off email marketing, events have just become sales pitches and cold calling just shows you as a company are desperate. Add to that the average output of corporate content just adds to the noise we all try and avoid. 2018 has proven out the test cases that you can close $1M deals through social and moved the buyer of these services from early adopter to majority. “There’s a difference between vanity metrics and actual ROI. Unilever and other high-level brands have been burned using “influencers” and have stated they won’t use influencers in the future. 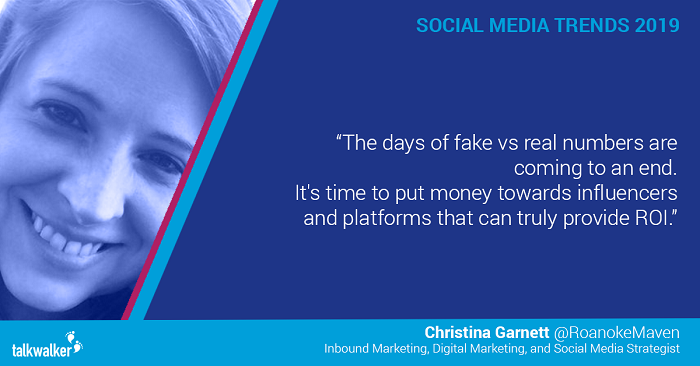 With Twitter and now Facebook/Instagram removing accounts that are either bots or using tools to create fake growth, the days of fake vs real numbers are coming to an end. 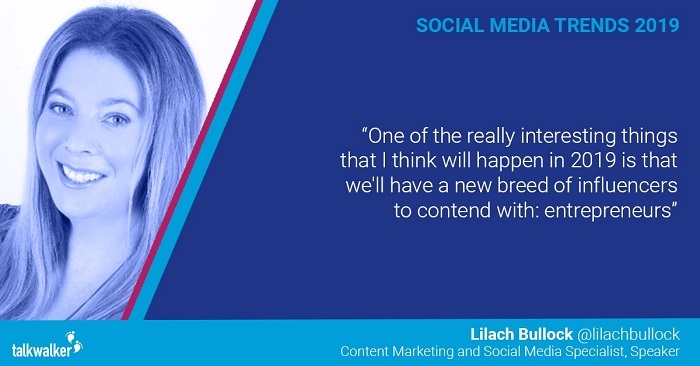 “Social media marketing is reaching a state of maturity with business leaders realizing that social media marketing isn’t only about followers, reach or post likes. Ultimately, it all boils down to the core business metrics, especially the ROI. 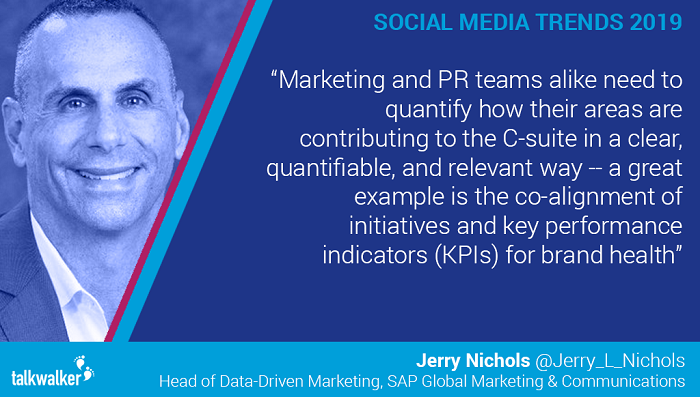 Social media and PR budgets can no longer be justified using ambiguous metrics. As KPIs and metrics co-align, marketing and PR are going to integrate more and more in the coming year. That’ll mean closer cooperation in strategies, and more consistent brand output, driven by a single source of truth. If you want to prove the value of your PR, you need it to work alongside your marketing efforts. “Uggggggg. It makes me sad that marketing and PR are more readily becoming one. I am a big proponent of metrics and making decisions based on data, but the PR industry should have stood up 10 years ago and taken control of this. Instead, our marketing brethren have known exactly what to do with data and are owning it. The big business strategy trend next year will be to focus on data maturity. 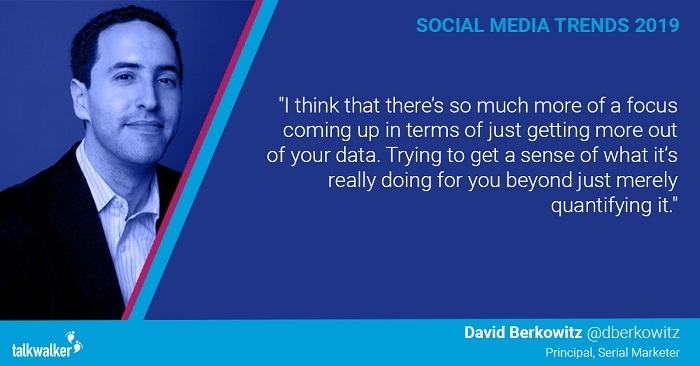 Brands will finally encapsulate a complete data set into their strategy and operations, to manage data more effectively, and drive more impact. “In 2019, businesses will finally take control of their data. The world is changing fast, and businesses need to manage their data more effectively. By aligning key KPIs across all aspects of their brand, with clearly defined benchmarks and customer-focused data sets, they can truly scale their business. 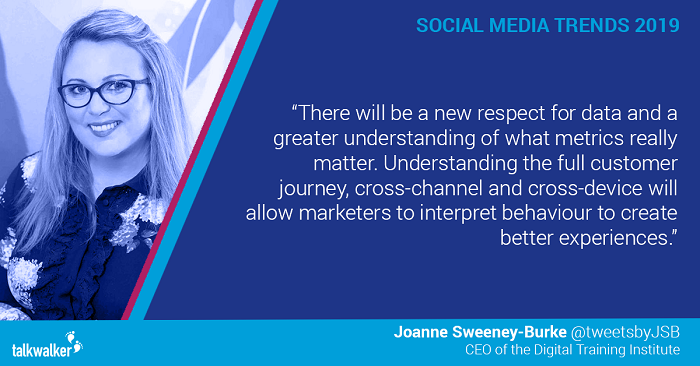 “Data has been a thorn in the side of marketers and brands for so long, but 2019 will represent a sea-change in how we embrace the metrics. Single-view dashboards along with proper tracking across channel and device will see brands get better results. Technology is advancing every day. 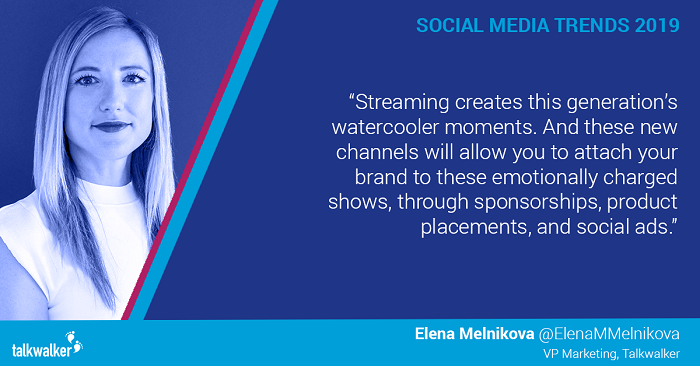 From AI to live streaming, the social media marketplace is an entirely different beast from the start of 2018. Next year will be when marketing personnel and social media networks will integrate these advancements into their brands. 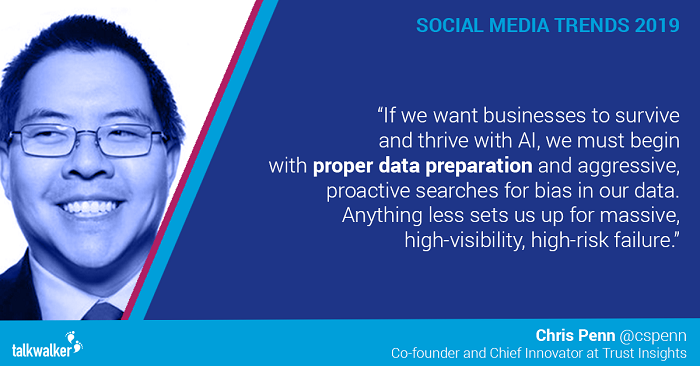 This is the year AI will make a noticeable difference to marketers, helping them with practical solutions on handling large data. 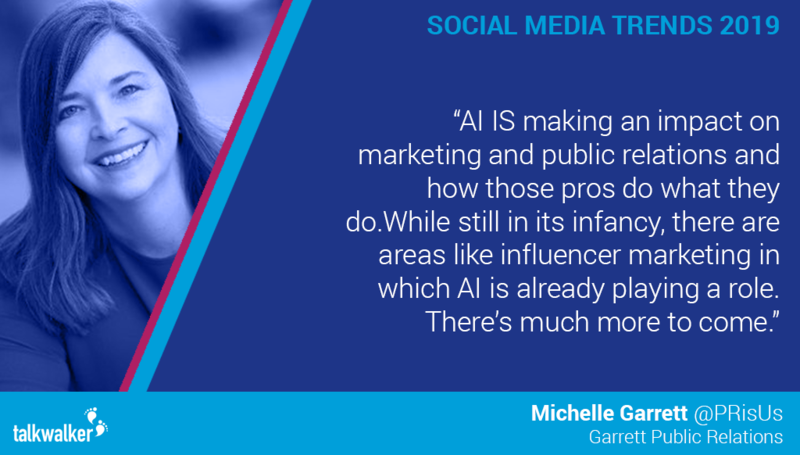 After all, it does empower faster brand insights for AI marketing. 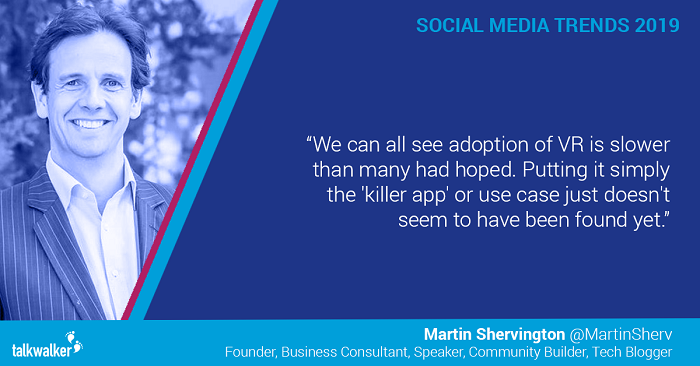 With the likes of Alexa and Google Assistant now establishing themselves in homes, and the rise of ephemeral content, the way people search will change too. 2019 is when you will have to shake-up your media strategy to account for this. “The past few years I have been very interested in the possibilities of image recognition.Image recognition is already in the hands of many brands that often leverage it to spot their logos and products throughout the internet but there’s a new use that really has caught my attention. Snapchat just announced a partnership with Amazon to offer “visual search” shopping directly from the Snapchat app. 2019 will bring in a new reality. But will it be an augmented reality, or a virtual one? Expect there to be more blurring of the lines between reality and artificial, as virtual influencers increase through the year. And next year could be the year VR finally takes off. “I’d love to say I see Social Media transforming itself with Virtual Reality (knowing I got married in VR May 2017), but we can all see adoption of VR is slower than many had hoped. Putting it simply the ‘killer app’ or use case just doesn’t seem to have been found yet. Next year, the likes of Amazon and Netflix won’t control streaming services, with social media platforms like Facebook and Snapchat expanding their live video options with original content. Society is changing. 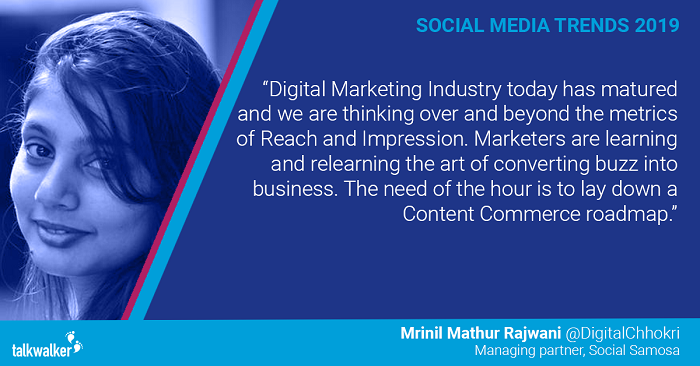 And with a new generation, comes new expectations, new marketing channels, and new challenges. This is what we expect to change in society in 2019 that you need to know about. 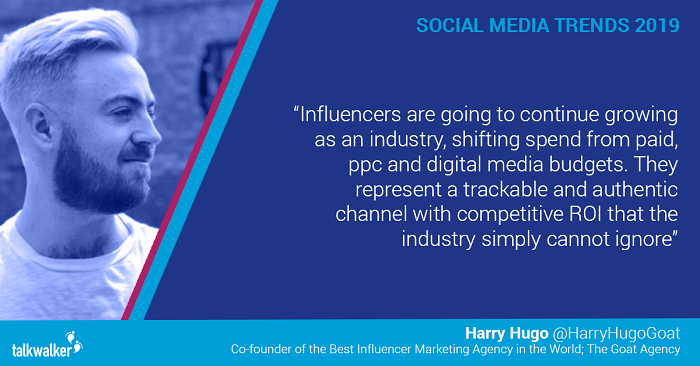 With influencer marketing platforms like Influencer One making this stream of marketing much easier, expect brands to continue growing influencer campaigns in 2019. 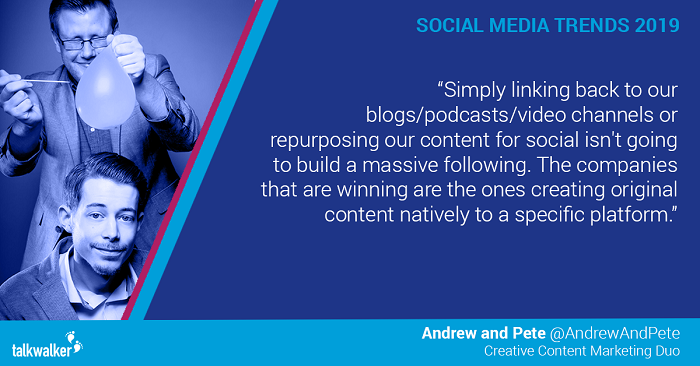 With more accurate result and ROI tracking, it won’t be celebrity influencers that will be leading campaigns. 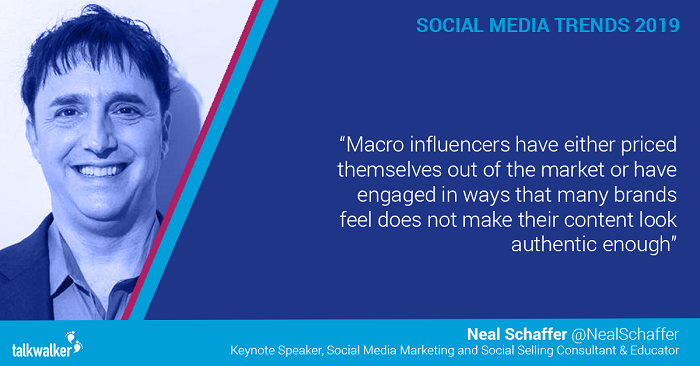 But will be more focused on brand ambassadors with engaged audiences, like the more impactful micro-influencers and entrepreneurs. “Every audience pays attention to some set of publications and people. It doesn’t matter if we’re talking about a super-niche, B2B buyer in chemical engineering or a broad consumer base like women’s fashion. 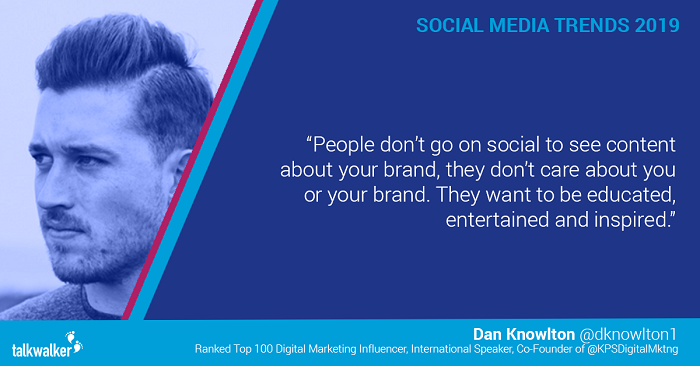 In every market, there are podcasts people listen to, events they attend, individuals to whom they listen, media they consume, websites they visit, and social accounts they follow. But a weird thing has happened in the marketing world: agencies and brands have stopped looking for all the sources that influence their audience and instead shifted an enormous amount of attention and dollars to buying promotional posts on just one place — Instagram — from very specific kinds of individual “influencers.” It’s bizarre. Generation Z are now entering the workplace. Which means adapting your customer experiences to meet the demands of a new generation. 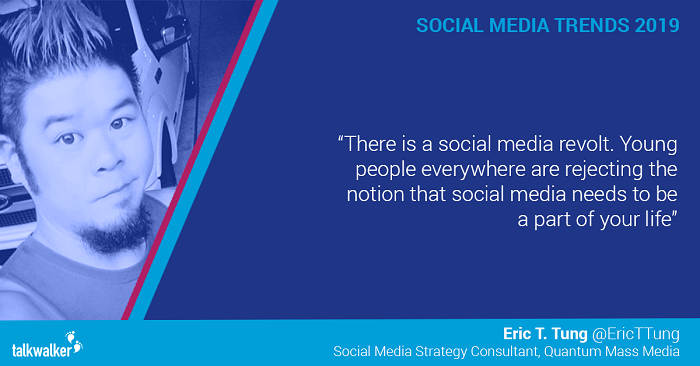 “There is a social media revolt. Young people everywhere are rejecting the notion that social media needs to be a part of your life. Because of this, companies need to find ways to make social media helpful and useful, educational, or entertaining to people, or lose them forever. Expect the buying cycle to change dramatically next year. 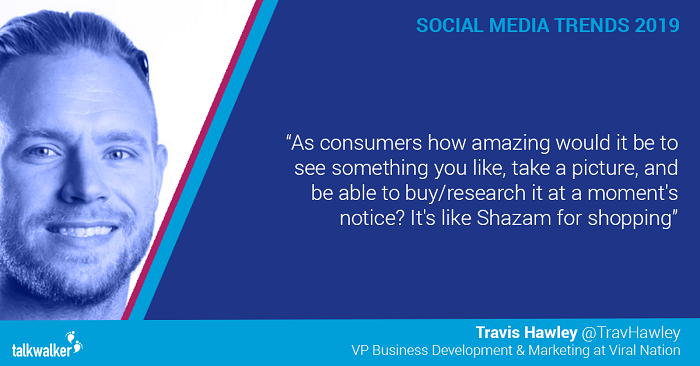 With integrated sales in places like Instagram Stories and Facebook Messenger, and an increase in the relevancy in reviews, you will have to adapt your social media marketing to drive direct sales. Brand purpose is going to drive more decisions than ever before. With the rise of campaigns like Iceland’s recent #NoPalmOilChristmas, which went viral on social networks after being banned on TV, expect brands to focus more on their consumers’ emotional drivers. “Consumers used to accept that their favorite brands were neutral. 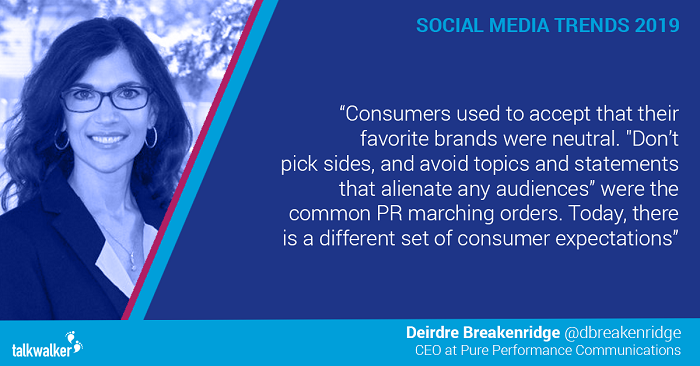 “Don’t pick sides, and avoid topics and statements that alienate any audiences” were the common PR marching orders. Today, there is a different set of consumer expectations. 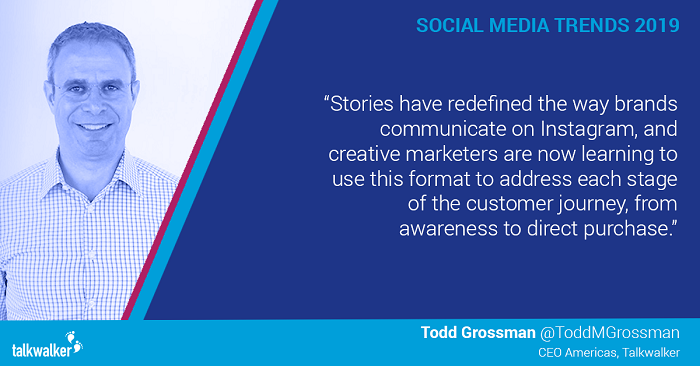 Businesses are required to have a voice and to take a stance for their customers on important topics. 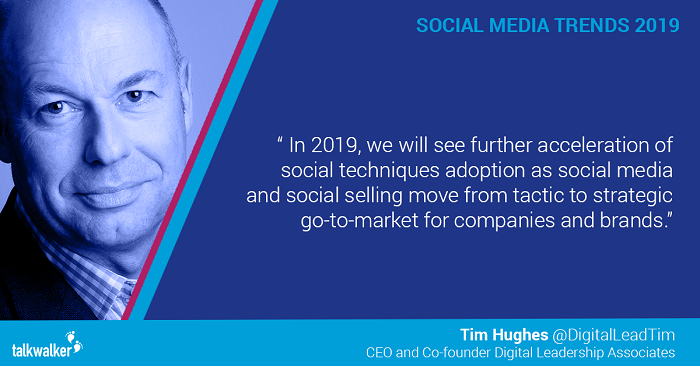 If you would like help developing your 2019 strategy – contact us and get social in 2019!